With chic modern styling, and an excellent reputation for both its sea keeping abilities and build quality, the Swift Trawler 44 makes an ideal coastal or long distance cruiser. 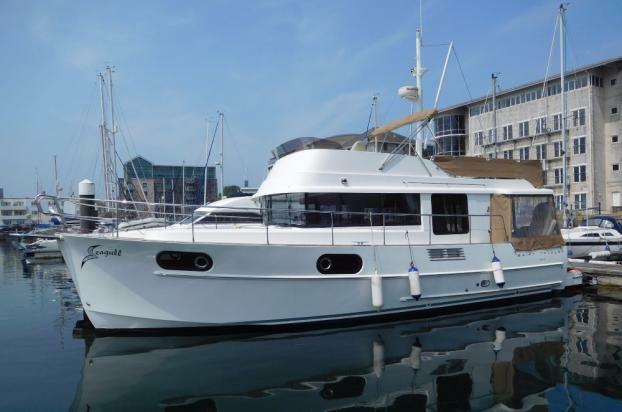 This Swift Trawler 44 has been well maintained and equipped for comfortable cruising. Full engine and generator service, fresh antifouling and hull polish date from May 2016. A new acrylic flybridge cover was only fitted in Dec 2016! Recorded engine hrs in Jan 2017: just 219! The boat is located in Sutton Harbour Marina and is immediately available. The vendor will consider a Part exchange, both sail & power. Please contact us for further details on 01752 228855 or email us.. Shore power connection with battery charger, immersion heater and various outlet throughout the cabins. 12 volt battery system supplied by 4 x domestic batteries, 2 x AGM batteries - replaced in 2014 and 2 x thruster/windlass batteries. Forward cabin with a double island berth, hanging locker, opening deck hatch and ensuite heads access. Port side guest cabin with two single berths, hanging locker and portlight. Starboard side heads compartment with electric sea toilet, wash basin and shower. Wheelhouse with a Starboard side helm position with bench seat, side door access to the side deck. Large galley opposite the helm position with a triple burner gas cooker and oven, twin stainless steel sinks, fridge, microwave and ample storage compartments. Main saloon with a large settee to Starboard - this converts to form a double berth. Saloon table and extra seating. Large sideboard storage cupboard to port. TV/DVD player. Double sliding door to the cockpit with seating, bathing platform access door and stairs to the flybridge. Large flybridge with a central forward helm position with helm and navigators seats, Port side "L" shaped sette with table, large sun lounger opposite. Flybridge wetbar with sink, and grill. Large storage area aft. Raymarine 240E DSC VHF radio. Radar mast with boom and winch for dinghy lift. Automatic engine bag fire extinguisher. Large cockpit with seating and teak decking.